As so many of you readers understand all too well…when you’ve started playing around with different racquets, strings and setups – it becomes a never-ending quest. Or perhaps journey is a better word – because at different points in the journey you need to stop and stick with a stick. Right now, that stick is the Tecnifibre Tfight 315 ATP Ltd for me. I use the 16/19 string pattern, but if you prefer a lower launch angle and better directional control, there is also a 18/20 model . What I like about this racquet is the feel. The sweet spot is small, but it is exact and you know when you’ve hit it. It plays very similar to a Head Pro Tour 630 or PT57A (pro stock code) and for most racquet aficionados – that’s a great thing. Another benefit is that it’s affordable, especially compared to a PT57A which retails around 350-400 euro on the bay and the forum for strings. It’s retailing around 120 USD/euro or less brand new from the tennis warehouse or Amazon . If you think this might be the stick for you, make sure not to buy the later Dynacore edition as it’s not at all similar. What I do with my Tecnifibre Tfights is put plenty of lead in the head to increase the stability and plow-through. The swing weight out of the box is very low and I really think you need to do this to unlock the racquets potential. I bumped my racquets up to 349 grams with lead at 3,9 and with some extra silicone in the handle that put the balance point at 31.5 cm. I then string with my go-to string Solinco Hyper-G 17 at 22.5 kgs (51 lbs) and plays great. With the open string pattern I can generate lots of spin, but the flexy feel of the racquet (59 RA) still allows me to have some deft touch on volleys and drop shots. I’ve heard that a gut/poly combo is heaven in this racquet, but I’ve yet to try it out. Maybe I’ll order some Wilson Champions Choice or Babolat VS + RPM Blast hybrid sets (they’re both excellent!) and start experimenting. Any hybrid string pack involving natural gut is expensive, but it sure is a fantastic feeling setup so I might treat myself soon. After all, it’s soon Christmas. To summarize, I’ve played with these racquets now for a few months and I’m super happy with them. I hope that feeling lasts. It really works well for my game and the small sweet spot reminds me to move my legs and keep my technique true. If you try the Tecnifibre Tfight 315 ATP Ltd, make sure to give them a few sessions and try adding lead to the head. You should never give up on a racquet until you’ve really given it a proper chance to settle in your hand and head. 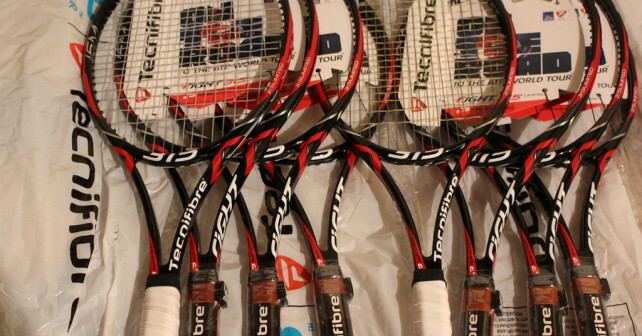 What racquets and setups are you using right now? Are you looking for a racquet recommendation for your level of tennis? Don’t hesitate to leave a comment! Now I Really want to try the 18×20 with a hybrid of a thin multi/ poly..
Haha, no I’m not selling them! 😉 I’m really curious about the gut/poly combo and just bought a Babolat VS Touch set to hybrid with. I might try RS Lyon first since the string profile is round and it won’t eat into the strings. Will post on how it plays. Lol, that is my picture!!!! (the main pic at the top of the page) I remember when I took it!!! It’s funny because now I use bare leather (and I have more Tecnifibre LTD’s!!) instead of my old white overgrips. 🙂 Glad that it is being put to good use!! Did you get a chance to try the Gut/poly in the 18M? It gives it an amazing boost of power amidst the perfect amount of control that the 18M gives you. Hi Johnathan, hehe, I didn’t know! Will make sure you get cred for taking the picture. I haven’t tried the 18×20 string pattern yet, I appreciate a little extra net clearance. I tried Gut/Poly in my 16×19 but I prefer the feel of poly to be honest. Currently testing Ytext Quadro Twist. Pretty nice feeling string. It’s all good!! Glad to see it getting put to good use!! I am going to have to try some Hyper G in the Tecs next restring!! Good luck out on the courts!! Hi, have you had a similarly good experience with the 295 version? Appreciate you’d need to add more lead but is it essentially the same racquet? Appreciate the help as I’m looking to get a couple. I think there’s quite a lot of difference between the 295 and the 315 as it’s not the same mould. The beauty of the 315 Ltd is that it is a close copy of the Head Pro Tour 630 which has a legendary feel. So if you’re looking for the feel of the Tecnifibre 315 Ltd – the 295 won’t do the trick. I haven’t tried it however so it might still be a good racquet, but I’m sure that even with lead it will feel quite different. The Tecnifibre 315 Ltd is a great, arm-friendly racquet for you. I’d recommend putting lead at 3 and 9 to make it more stable and closer to your Wilson Six One 95. I personally love both racquets, but I think with the lighter weight and the more arm-friendly flex, the 315 Ltd would be my choice. I’m not using the 315s anymore, but now I kind of regret selling them, because they are great racquets. I had a leather grip and strips of lead at 3 and 9 and really enjoy the racquets strung with Solinco Hyper-G. Thanks for the reply. I’m still recovering from tennis elbow at the moment so haven’t had a chance to test out the 315 just yet. Wow, I’m surprised you abandoned the 315 because you were raving about them so much. What made you stop using them and sell them? And what are you using now? BTW, how did the Head LM Tour work out for you? It’s a pretty stiff racquet isn’t it? I’m surprised I abandoned the Tec 315 Ltd too! Kind of regretting it, but I like moving over to new sticks from time to time. I don’t really have an explanation for leaving them, at the time I really wanted to try the new Pure Strike and try to make it work with a more powerful stick with a larger sweet spot. But what happens is that I always go back to 95 sq inches, heavier and more flexible frames in the end anyway. Just fits my game better. I’m currently enjoy the LM Radial Tours. I don’t find them stiff at all, listed RA is 63 and before I checked, I thought it was more around 60. I haven’t used them with full poly however and currently stringing them up with Solinco Hyper-G. Will be interesting to see how they react to that string. I have a feeling I’ll probably end up with Angells or Wilson Ultra Tours in the end anyway, but I’m going to give these LMs a real try first! I found the LM Radicals to have a rather stiff upper hoop even though the throat is flexible. I have a bad habit of hitting high up on the stringbed so the LM Radical is a no go for me. I actually found the 6.1 with 67RA more comfortable because of the softer upper hoop. I’m wondering about the comparison between the 315 Ltd and the DC 315 Ltd. You stated in this article that “If you think this might be the stick for you, make sure not to buy the later Dynacore edition as it’s not at all similar.” Were you referring to the DC 315 Ltd? I’m confused because this article was written in Nov 2016, and in your more recent article (Sep 2017) on the DC 315 Ltd, you stated that “My gut feeling is that this racquet will play very close to its successor” (I assume that you meant predecessor, not successor), and you indicated in the comments section that you had not yet tried the DC 315 Ltd.
Can you clarify regarding the similarity between the 315 Ltd, DC 315 Ltd, and Pro Tour 630? I mean the Tecnifibre Tfight Dynacore 315 (not LTD) which was a different racquet. This was before I knew they would release a new LTD-version. Sadly, I haven’t played that one yet, but I think it should be similar. The flex of the HEAD Pro Tour 630 is more pronounced (some love it, some don’t) and it’s less good for customization since it’s already heavy. And you can also choose string pattern with the Tfight 315, either 18×20 or 16×19. Personally I think Tecnifibre did a great job with the Tec 315 Ltd and if you don’t like that frame you probably won’t like the Pro Tour 630. How much weight did you put at 3&9? I think I played around with another two strips at 12 o’ clock for some extra power (this makes it 8 extra grams in the hoop). I don’t really remember what I liked best. Really fun racquets for customization though. Please note I usually counter balance in the handle (I put in white/blu tack in the handle for this one, but silicone works as well) but I’m fine with a more head heavy racquet so I usually don’t put the same amount of weight in the handle as in the hoop. That is up to personal preferences however! Wow, that’s a lot at 3&9! I have three of the new TFight DC 315 LTD 16×19’s, and am experimenting with finding my ideal twist weight. I set all three up slightly differently, with 3, 4, and 5 grams split at 3 & 9 across the racquets. I then added exactly enough weight at 12 to take each racquet to an exactly 340 swing weight, and then added lead tape wrapped around my grip to take the balance to exactly 8 points head light when strung for all three racquets. So they don’t all have the exact static weight, since the difference between the weight requirements to get to 340 SW were different due to different distributions, and also different for the handle to reach the balance as well. If it weren’t for the obviously differing skill level, my stroke and playing styles are just like Wawrinka’s. I’ll be curious to see how close I get to his specs before I finalize my setup. Oh, and one last question! With my weight being distributed at 12, 3 & 9, once I am finalized, would there be a difference in how it plays if I were to calculate the center of mass and consolidate distribution to 10 & 2? My thinking is I will be able to calculate my swing weight and twist weight with my 12, 3 & 9 setup, and then determine how to achieve the same values with distribution just at 10 & 2, in order to place the weight underneath the bumper guards. Any thoughts on that? I have a gut inclination that I might end up with a Yonex VCORE Pro 970 310, but weighted up even more than a stock 330, just in a more polarized manner. I really like to be able to whip insane topspin so that the ball takes off the ground with more kick and speed than before the bounce. It takes so much effort for me to do it with the more evenly distributed weight on the RF97A, but found I really like the more polarized TFight 315 LTD.